Old Shep Larger image below. M- Disc only - Super rare white label promo one-sided disc - Never offered in this condition - Label brand new - Shiny, practically new wax with very light paper scuff. This is written in stone!!! Once you leave feedback for us we will respond by leaving feedback for you within 24 hours. We care and will always take that extra measure to satisfy you. Elvis Unique Record Club 10933 East Elmwood Street Mesa, AZ 85207. 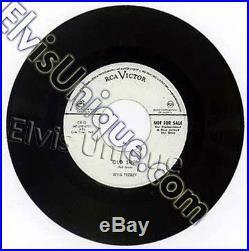 The item "Elvis Presley Old Shep One-Sided Promo Single" is in sale since Monday, July 31, 2017. This item is in the category "Music\Records".